This month’s dividend income report is a spectacular example of the benefits of dividend investing. Consistently adding new money every month into fantastic companies that pay cash to hold them is providing the desired effect… a nicely growing dividend income stream. Oh, and net worth also made a big jump in May. I am ecstatic with the progress I’m making with dividend income. While the path is not quick, it is taking me to my desired goal – building a cash flow machine that will cover my early retirement! This month I received $957.16 in dividend income! On average, I was paid $33.01 from 29 different companies!! This month’s dividend income is a hearty 212.94% increase over May 2107. That’s $651.3 more dividend income than last May! This is the second month in a row that I have made over $600 more than the previous year! 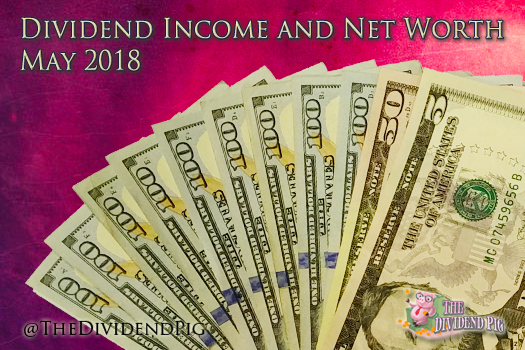 This month’s dividend income covers all my utilities, internet, cell phone and grocery shopping for the month! I’ve seen quite a few dividend blogs that list their realized dividend raises each month. I think this is some wonderful information so I will share mine here as well! I’m happy to report that 5 of my holding paid an increased dividend this month. While PG dividend raise was only 4% (more is still more, right) the other 4 hovered around 14%. With the stock market moving up, net worth is climbing with it. A little walk down memory lane. This time last year I was still in the process of finishing my basement. Honestly, I can’t believe it’s only been a year (normally time passes quicker not slower). The money that we invested into our basement has given us some amazing times in only a year. I can’t count how many family game and movie nights we’ve had down there now. I write that to say, while we did spend a lot of money to fix up our basement (we did all the work ourselves, so it wasn’t crazy money), the return that we’ve received in terms of fun has been off the charts! As for cash sitting in the bank, you can see, I still have a lot. This money came from the sale of rental property #1 and has been earmarked to pay off my mortgage. However, as you can also see, I still haven’t paid it off and it’s still sitting in the bank. I received a disturbing letter in the mail. Our county is raising our property taxes. Not by just a little bit, but buy a lot, a WHOLE LOT… like an extra $2,000 a year! I will appeal their new, unrealistic appraised value, however, until that appeal happens (and is hopefully granted) I’m on the hook for the extra amount. I’ll keep you updated on how this shakes out. I’m continuing to pay down my mortgages at a pretty impressive clip. I’m clearing a little over $2,000 in mortgage debt every month! A huge physiological impact. Rental property #2 is doing great and the renter is continuing to pay on time and without issue. Best kind of renter to have! I am certainly pleased with the progress I’m making on the dividend income front. My portfolio says that forward dividend income now surpasses 12k a year! It’s an exciting position to be in and I’m very grateful. However, we will see what happens as the ominous inverted yield curve that’s permeating the news gets closer and closer to flipping. If it does invert, and a recession follows, having a large trough of cash to buy up undervalued dividend growth stocks will be extremely valuable. We’ll just have to wait to see how everything shakes out. How did you do in May? Break any monthly records? Wow, that is one hell of an increase year over year, and some crazy dividend income. (could be even higher once you deploy that cash). Looks like a solid month, and some nice raises as well! Thanks Jordan. It’s obviously taken some serious investment to get there, but well worth it! I’ve got to come up with a solid plan for that cash. This teetering between paying off my mortgage to keeping it for a rainy day is stupid. I’ll work on it. Thanks for dropping in and commenting! Considering you have both I’d love to hear your thoughts on real estate vs dividend payments. DO you prefer one over the other? Hi Evan, I actually have a post about that coming up. I’ll give you the quick answer. I like both. However, there is a lot more work (manual labor type activities) that comes with my rental property. Since going from two rentals down to one, I can easily say I have less “work” to do and have more free time. However, the yield from the rental property is roughly double my dividend portfolio yield on cost. So there is the rub. Anyway, more to come on this topic later. Good to hear from you! Thank you OthalaFehu! Yeah, everything is split up in the net worth spreadsheet. My 401k, tax deferred (ROTHs) and taxable account are separated on the net worth report. Those three accounts make up the dividend portfolio – minus any funds or ETFs i’ve yet to sell. Last year we were given control of our 401k and allowed to invest anyway we want. Obviously, this was a big boon for the dividend portfolio! Thanks for pointing that out, I’ll try and make it more clear on the next report. Great to hear from you! Wow, I would love to get control over the 401k like that, we are stuck in the same tired funds. Thanks Doug! I wish that would continue. Sadly, my dry powder is mostly wet now. Time to start that $1k/month engine : ) You are there, essentially! So awesome, congrats! Thanks Lanny! You’re right, i’m pretty much there. I suspect it will be this time next year before I actually accomplish 1k a month. Still, a very good place to be in! Always good to hear from you! Thank you Caroline. We pretty much get the foreign taxes we pay on dividends back at the end of the year through our taxes (needs to be a taxable account). Does Canada have a similar program? The FX part of the equation… well, yeah I bet that could be difficult. Keep up the great work over there and thanks for stopping by! Right now, you’re champion on dividend growth by comparison of last to previous 12 months. Congrats! Hi Torsten. Really cool stats you’ve got there. Good for you maintaining that gigantic list, I bet that’s a lot of work! Thank you for the adding me to the list and it’s great to meet you! glad you like. Indeed, it’s work. It’s my work. The German twin website makes the money I am living of (combined with dividend and option income). But it’s also fun tracing the progress of so many and finally meeting the people behind these numbers. After launching Income Heroes today I sent mails to all bloggers included in the list. See you latest next month! Dang, that is some crazy YoY growth you’ve had–very nicely done! On the mortgage front, I completely get that feeling as I recently received a lump sum that I originally planned to use to pay off my mortgage. Ultimately, I used most of it to build my new DGI portfolio instead and am planning to use my upcoming bonuses to throw at the mortgage (or may end up holding in cash like you’re doing in case there is a great opportunity). Thanks DivvyDad! Glad to hear it isn’t only me with this struggle. It’s hard for me to find the right mortgage pay down to investing ratio. I love the freedom that a mortgage free life will provide. However, I also know that I have lots of time to pay off the mortgage and I don’t need to rush into it (especially with having the ability to do it at anytime). On the other side, having a large pile of cash just sitting around for something terrible to happen doesn’t seem prudent either. Anyway, I am very grateful to be in a spot where I have to make this decision. Nice to meet you and thanks for sharing the path you took! Received my bonuses and transferred the money over to my AmEx savings account. Going to hang onto it for a few months to let it all sink in and make sure that paying off the mortgage is what I truly want to do–and share the sentiment of being grateful to be facing this decision. Nice meeting you as well and look forward to following your journey! I gotcha, why be in a hurry! Oh, and congrats on the bonus! Fantastic results, Blake! A 212.94% YOY increase is seriously impressive considering that you received $957.16. I’m holding one of the companies on your list and there are a few I want to add (SBUX and AAPL). I’m mostly holding Canadian stocks because of the tax implications though. 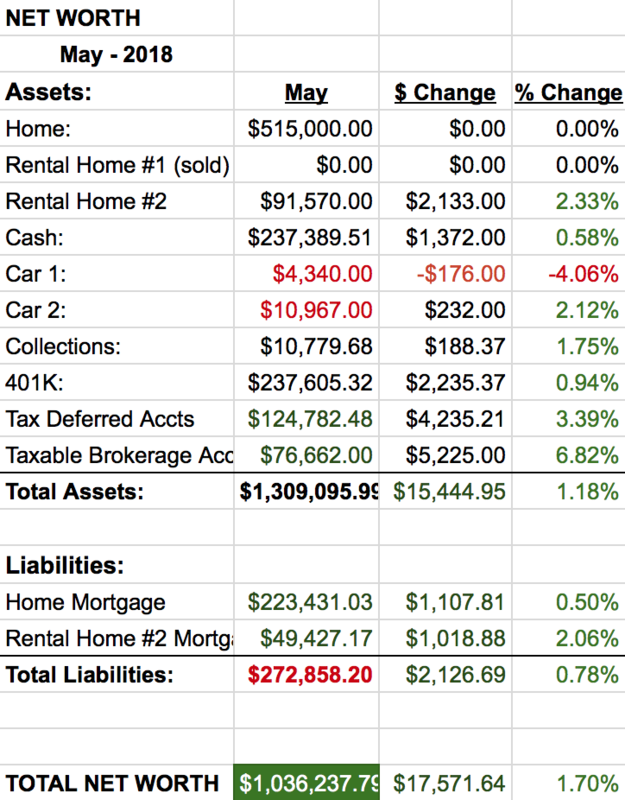 In regards to my dividend income, May was not a record breaking month. But it was an improvement over the last quarter. Thanks for sharing the motivating report! Thanks RTC! As “they” like to say, stay focused and keep moving forward! Sounds like you’re doing that well! There are a lot of great Canadian stocks, especially those banks! I kick myself every time I look at RY – I still can’t believe I didn’t buy when they were yielding 6%! Thanks for coming by and saying hello! DGI is not quick by any means but the steady consistent progress is what we’re all after. Solid total for the month of May from your long list of dividend payers and with a triple digit year over year gain you are well on your way. That’s a lot of cash sitting in your bank. I know it’s temporary but seeing all that cash earning zero kind of hurts. Better put that money to use already.